Workers' Memorial Day is April 28: Find an event in your area! In a two-to-one opinion, the D.C. Circuit denied SeaWorld’s appeal of the decision of the Occupational Safety and Health Review Commission that SeaWorld violated the OSH Act’s general duty clause by permitting close contact between killer whales and trainers during shows at the company’s Orlando, Florida theme park. OSHA cited SeaWorld for two violations of the general duty clause following an investigation into the death of trainer Dawn Brancheau, who was pulled into a pool by a killer whale named Tilikum in February of 2010. One of the violations concerned close contact between trainers and Tilikum; the other violation concerned close contact between trainers and all other killer whales in SeaWorld’s inventory. Olivet Management LLC faces $2,359,000 in proposed fines for exposing its own employees and 13 contractors to asbestos and lead hazards during cleanup operations. The Dover Plains, N.Y., real estate development and management company owns the former Harlem Valley Psychiatric Center in the Wingdale section of Dover Plains. OSHA’s Albany Area Office conducted an inspection in response to a complaint and found that Olivet failed to train employees about asbestos and lead hazards, monitor workers’ exposure levels, provide appropriate respiratory protection, and post notices, warning signs and labels to alert workers and contractors to the presence of asbestos and lead. Read the news release for more information about the citations. Case Development LLC, the general building contractor of an apartment complex in Norman, Okla., has been cited by OSHA for serious and repeat fall hazard violations and proposed fines of $90,600 following a November 2013 inspection. Falls are the leading cause of death in the construction industry. The inspection, initiated under the agency’s Regional Emphasis Program on construction fall hazards, found that the company failed to protect workers in aerial lifts from falls and failed to protect residential construction workers from falls. OSHA's fall prevention campaign provides information and educational materials about preventing falls when working from ladders, scaffolds and roofs. Read the news release for more information. Public hearings for the proposed crystalline silica rule concluded on April 4, and OSHA thanks all stakeholders for contributing their time, effort and expertise to the rulemaking process. To offer participants additional time to prepare post-hearing submissions, OSHA is extending the submission deadlines by 15 days. Participants who filed notices of intent to appear in the hearings will be permitted to file additional information and data relevant to the proceeding through Tuesday, June 3, 2014. Final briefs, arguments and summations will be accepted through Friday, July 18, 2014. Post-hearing comments and briefs can be submitted in hard copy or by visiting the federal government’s online rulemaking portal at www.regulations.gov. OSHA’s final rule to improve workplace safety and health for workers performing electric power generation, transmission and distribution work has been published in the Federal Register. The final rule revises OSHA’s 40-year-old construction standard for electric power line work to make it more consistent with the corresponding general industry standard and also makes some revisions to the construction and general industry requirements. In addition, the standards adopt revised approach-distance requirements and add new requirements to protect workers from electric arcs. General industry and construction standards for electrical protective equipment are also revised under the final rule. The rule becomes effective July 10, 2014. OSHA adopted delayed compliance deadlines for certain requirements. Additional information on the final rule is available at www.osha.gov/dsg/power_generation/. Motor vehicle crashes are the leading cause of death on the job, accounting for more than 2 out of every 5 fatal work injuries in 2012, according to the Bureau of Labor Statistics. The Department of Transportation has now launched a national campaign to stop texting while driving and other distracted driving hazards. To learn more, visit www.distraction.gov/. OSHA reminds employers that they have a responsibility to protect their workers by prohibiting texting while driving. It is a violation of the OSH Act if employers require workers to text while driving, create incentives that encourage or condone it, or structure work so that texting is a practical necessity for workers to carry out their job. For more information, including a Distracted Driving brochure, visit OSHA’s Distracted Driving Web page. OSHA has issued an interim final rule establishing procedures and time frames for handling retaliation complaints under the Consumer Financial Protection Act. Public comments to this IFR must be submitted by June 2, 2014. See the Federal Register notice for submission details. A new fact sheet explains who is covered under the CFPA, which activities are protected, and how to file a complaint. In addition, OSHA fact sheets on filing whistleblower complaints under the Sarbanes-Oxley Act and Moving Ahead for Progress in the 21st Century Act are now available in Spanish. For more information about CFPA, SOX and other whistleblower provisions enforced by OSHA, visit www.whistleblowers.gov/. From left: John Mascaro Jr. of Mascaro Construction Co. and Christopher Robinson of OSHA's Pittsburgh Office. OSHA’s Pittsburgh area office signed a partnership with Mascaro Construction Co. on March 21, emphasizing increased safety for employees involved in the construction of an approximately 204,400 square-feet corporate headquarters facility for Industrial Scientific Corp. in Robinson Township, Pa. The partnership was developed to encourage joint cooperation between OSHA, Mascaro Construction, trade contractors and the Pittsburgh Regional Building Trades to foster a safe work environment for all employees. The agreement is aimed at maintaining a safe work environment and reducing the number of serious injuries, which historically occur at sites of this proportion. The project will employ approximately 150 union trade workers during peak construction. Recognizing the need to protect its workers from high-hazard work, VonRoll USA Inc., a manufacturer of nonmetallic mineral products, reached out for help from OSHA's free On-site Consultation Program. By developing a strong safety and health management system, the company reduced injury and illnesses rates at its Schenectady facility considerably below industry averages, which led to a savings of more than $200,000 in workers’ compensation insurance costs. When VonRoll’s Schenectady location was accepted into OSHA’s Safety and Health Achievement Recognition Program, it inspired the company to seek SHARP status for its facilities in four other states. So far, the company’s Georgia and Ohio facilities have also been accepted into SHARP, while its facilities in Connecticut and New Jersey are in the planning stages of a consultation visit. For more information, see the story on VonRoll USA’s success. On April 3-4, 2014, OSHA joined the White House Initiative on Asian Americans and Pacific Islanders and other federal agencies to host a conference with leaders in U.S.-associated Pacific Island jurisdictions. Conference participants, including OSHA Region IX Administrator Ken Atha, discussed strategies for improving the health, safety, housing, employment and training opportunities for AAPIs. For more information about the Initiative, visit www.whitehouse.gov/aapi. From left: Mary Walter and Jorge Delucca of OSHA; Lesbia Rodriguez of Wage & Hour; Victor Valtierra of the Mexican Consulate at Little Rock. During the Mobile Mexican Consulate and Health Fair in Springdale, Ark., March 15-16, compliance assistance specialists from Little Rock, Ark., and Oklahoma City, O.K., area offices provided OSHA outreach to 500 customers of the Mexican Consulate. 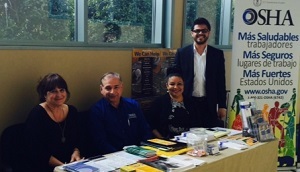 Attendees learned about OSHA’s mission and received free Spanish-language resources on worker safety. Dallas and Chicago regional offices have also furthered outreach initiatives by signing a new alliance with the Consulate General of the Philippines in Chicago. The alliance will increase education and training on worker rights and employer responsibilities, and emphasize specific industry topics like preventing falls from elevated work surfaces, electrocutions, heat illness, exposure to hazardous chemicals and struck-bys. For information on OSHA’s Alliance Program visit www.osha.gov/dcsp/alliances/index.html. The New Jersey Work Environment Council’s Safer After Sandy project, funded by OSHA’s Susan Harwood Training Grant program, provides free training on identifying and preventing hazards associated with rebuilding after Hurricane Sandy. Training topics include fall protection as well as respiratory, chemical and biological hazards. WEC also provides speakers and technical experts for meetings, educational materials, and assistance with media outreach. For more information and resources visit New Jersey Work Environment Council. On April 1, Christopher P. Lu was confirmed as deputy secretary of labor by the U.S. Senate. "Chris is an enormously capable manager and a devoted public servant, whose commitment to President Obama's opportunity agenda is second to none," said Secretary of Labor Thomas E. Perez. "I look forward to working with him on all of our priorities — from job training to wage protection to worker safety to benefits security." A senior fellow at the Center for the Study of the Presidency and Congress, Lu has served in the White House as assistant to the president and cabinet secretary and on Capitol Hill as legislative director and as acting chief of staff to then-Senator Barack Obama. Lu earned his bachelor's degree at Princeton University and his law degree at Harvard. Read the secretary's statement. In a series of Workers' Memorial Day events on and around April 28, 2014, OSHA's national and regional offices will honor the sacrifices made by those who have been lost, disabled, injured or made sick by their jobs. Workers' Memorial Day is also an opportunity to reaffirm our commitment to protecting the health and safety of every worker. To find a Workers' Memorial Day event in your area, visit OSHA's WMD events calendar or contact your regional OSHA office. New NIOSH page on the safety and health hazards faced by poultry workers. A new OSHA Safety and Health Information Bulletin addresses the serious hazards from applying flammable roofing adhesives using a dolly-type roller device. A new fact sheet provides information on safely using mobile, narrow frame scaffolds to avoid hazards such as falls, tip-overs, electric shocks and structural collapse. In addition, the National Institute for Occupational Safety and Health has published a new Poultry Topic Page with resources to help employers and workers identify risk factors and take effective measures to prevent work-related injuries and illnesses in poultry processing.